The names, job details and office phone numbers of about 100 employees were released online in a free file-sharing program. Montreal police said the breach amounts to an attempt at intimidation. 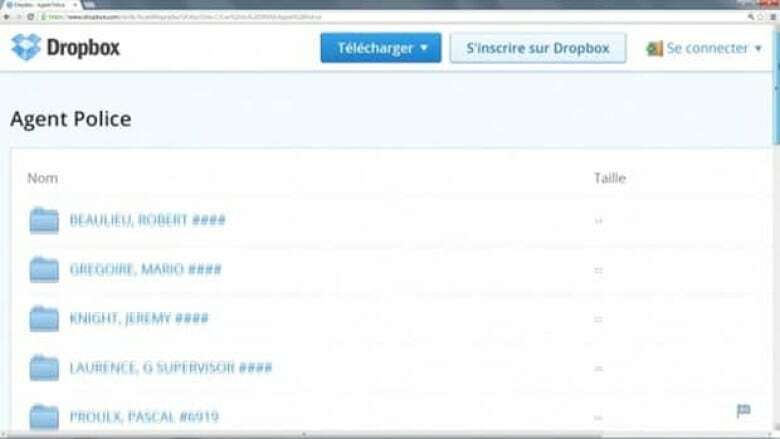 The information pulled off the Montreal police’s website and put into a Dropbox by an unknown individual or group this week wasn’t sensitive to begin with, said Montreal police spokesman Cmdr. Ian Lafrenière. The names, job details and office phone numbers of about 100 employees were posted online in a free file-sharing program. But Lafrenière said the details released are not sensitive and were already publicly accessible on the Internet. "It’s information that you can gather yourself," he said. "It’s not even a secret, it’s not even illegal, but putting all that together in a Dropbox -- for us, we consider that as intimidation." Though he said it may not have been illegal to gather the information, making it available in one location, accompanied by pictures of people named by the group as undercover officers, amounts to police intimidation -- which is illegal. "There is an investigation because this is clearly intimidation," Lafrenière said. He said the pictures in the Dropbox were not of undercover agents, but rather just ordinary people presumed by those behind the attack to be officers. "I got bad news for them: a lot of pictures they put there, it’s not even a police officer. We know these people and they are not police officers," he said.